I love playing with color. I love the design process. I am happy to spend hours staring at fabrics and putting them together in different combinations. In my professional life, I am a professor of music, a conductor, and a choral musician. I enjoy playing with vocal color in my choral ensembles, combining deep tones with vibrant singing and clear bell-like ringing. As a young person, I had transformative experiences living in Germany. The rolling expanse of countryside and beautiful birch trees spoke to me. I was enthralled by the intense colors of the expressionist painters of the Blaue Reiter. I have vivid memories of discovering art, beauty and solitude in Germany. 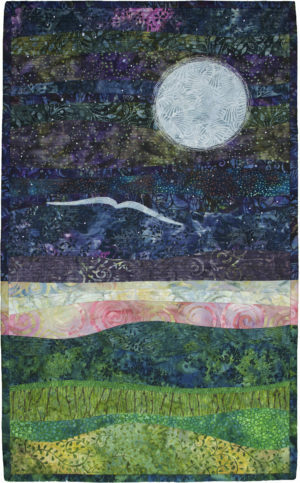 This quilt is inspired by the stillness and longing in Schumann’s music. I have always enjoyed walking alone in the evening. 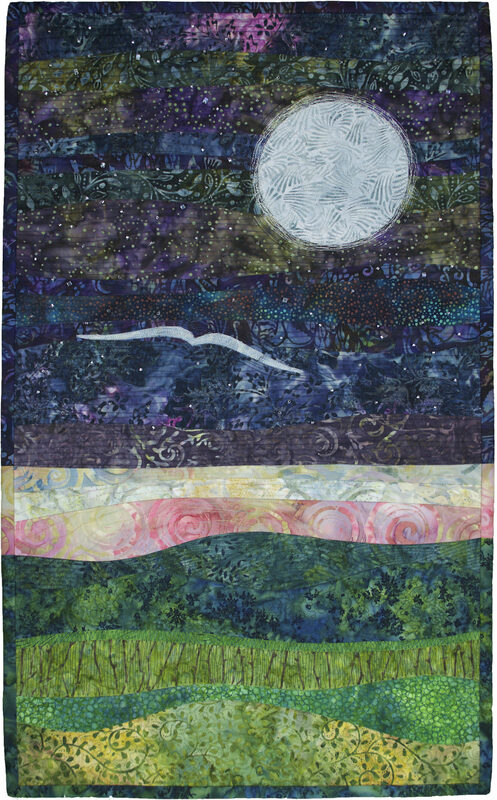 Mondnacht brings to mind the beautiful silence of gazing at the heavens under a moonlit sky. Must now only dream of him. The night was so starry clear. As if it flew toward home. Machine pieced. Machine quilted. Hand-beaded. Binding finished by hand. Various cotton batiks. Sulky rayon and metallic thread.